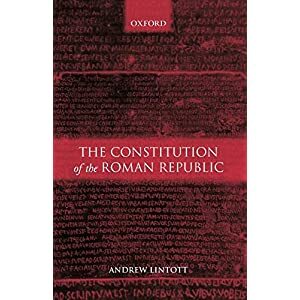 Prof. Andrew Lintott is a Fellow of Worcester College, Oxford and has recently retired from the position of Professor of Roman History in that university. He has had regular contact with Italy since the 1950s and has been a Visiting Fellow at the British School at Rome. 1.1 Would you please describe the changes that took place in the constitution of the Roman Republic as a consequence of the Macedonian War? There seems to have been a marked change that began around 151 BCE, and I'd very much appreciate your insights into the details of that change. 1.2 Would you please give us a more detailed description of the appointment of new Senators and the role the Censors played in this field during different periods? What were the qualifications to be appointed? Had the Censors free hands or were there any restriction for the Censors? What was the status of the "Senatores pedarii" and why were they "Senatores pedarii"? 1.3 Which was the weight of a Senatus Consultum compared with that of a Lex? 1.4 What was the role of the Consuls as legislators compared with the Tribunes during the Middle and Late Republic? Did the Consuls in anyway loose their legislative influence in the end of the Republic? 1.5 Had the Romans any real "priesthood" that acted collectively and tried to get a stronger position in the Constitution? Was that typical of the Roman Republic? 1.6 Was there any juridical difference between a priest and a magistrate, and between a priest and a common citizen? Would you please describe the changes that took place in the constitution of the Roman Republic as a consequence of the Macedonian War? There seems to have been a marked change that began around 151 BCE, and I'd very much appreciate your insights into the details of that change. From one point of view the constitution did not change: it still had a variety of citizen assemblies based on a census, a senate, and elected magistracies. From another there were a variety of constitutional modifications between 151 and the end of the republic, e.g. secret ballot, the development of criminal courts, statutory regulation of assembly procedure and of provincial government. In general there is a tendency to seek to control by statute what formerly had been a matter of mos. As Tacitus cynically remarked, ‘pessima re publica plurimae leges’ (Ann.3.28). However, I must confess that I do not really understand the point of this question. Why select the date of 151? What has this to do with the Macedonian Wars? The third Macedonian War was about to start. If the question is motivated by Polybius’ view that the democratic element in the constitution would get out of hand when there were no external threats, then the answer lies more in politics, i.e. in politicians exploiting the possibilities of the constitution, than the constitution itself. Would you please give us a more detailed description of the appointment of new Senators and the role the Censors played in this field during different periods? What were the qualifications to be appointed? Had the Censors free hands or were there any restriction for the Censors? What was the status of the "Senatores pedarii" and why were they "Senatores pedarii"? A. We must admit that we know almost nothing of the procedure for appointing new senators before Sulla’s dictatorship. What happened before the lex Ovinia, usually dated about 300 BC, was probably a matter of conjecture even for an antiquarian like Gellius. He thought that the consuls of the early republic chose whom they wanted (it is not clear whether this was just for their year of office or for life); in practice it is likely that the status was for the most part inherited with non-members elected to the consulship, praetorship, or military tribunate being co-opted. After the lex Ovinia the lectio senatus was conducted by the censors, not as an integral part of the census but as a separate procedure. New members probably took their places after the announcement of the list. However, once it became understood that the ‘best men’ included all those who had attained a certain magistracy, such magistrates, if not already members, may have sat in the senate even before the lectio that formally registered them. The phrase that we find in the lex Latina tabulae Bantinae (FIRA ,I no.6, line 23), ‘ those who have delivered or shall deliver their opinion in the senate’ , has been understood to refer to those in this intermediate status. The same may have happened when someone obtained a priesthood that involved membership of the senate. After Sulla membership seems to have followed directly on election to the quaestorship. So Cicero, quaestor in 75 BC, could sit on a committee of the senate in 73 (see the S.C. de Oropiis, FIRA I, no.36, line 12) and ex-quaestors could immediately join the senatorial panels of jurors. Of course the lectio carried out by the next censors would confirm or invalidate this, as it did the membership of any senator. Before Sulla, the lex Ovinia seems to have given the censors freedom to choose whom they thought were ‘best’, this last being determined by the values of the Roman elite. It is clear from the drafting of the epigraphic lex repetundarum (FIRA I, no.7, lines 13 and 16-17) that in 123-2 all former magistrates of a higher rank than tribune of the plebs would possess senatorial status, unless disgraced by criminal condemnation or in some other way such that they were regarded as ineligible. We are also told that the lex Atinia permitted former tribunes to sit in the senate. This was clearly passed after 123-2 but before Saturninus first became tribune in 103, since his membership of the senate was challenged by the censor of 102, Metellus Numidicus. Nevertheless, if the senate before Sulla numbered 300, the censors must have enrolled many who had not held magistracies as high as the aedileship or tribunate. Some of these would have been priests, but in my view a considerable number must have been selected according to birth, because they belonged to senatorial families. Sulla’s introduction of the quaestorship as the qualification did mean that the senate became more of a meritocracy. We do not know if there was a formal status of senatores pedarii under the republic. The phrase seems to refer to those who ‘ibant pedibus in sententiam alicuius’, i.e. showed their support for a speaker’s view without making a speech themselves. In the post-Sullan period one thinks of the mass of former quaestors who attained no higher rank. However, certain ex-quaestors made important speeches, notably Cato on December 5, 63. Which was the weight of a Senatus Consultum compared with that of a Lex? During the republic a lex (in the context of this question) was a legitimate resolution by an assembly of the Roman people. In the words of the prescript of a lex , (the proposing magistrate) iure rogavit populusque (or plebesque) iure scivit. The text was a series of commands, as appears from the fact that the main verbs were normally future imperatives (e.g. facito, curato, esto). Commands, however, have less force, if they are not backed by sanctions. By the late republic, a distinction had been developed between a lex perfecta and a lex imperfecta. In the text of the former there was a sanction (sanctio) against those who disobeyed it, usually in the form of a fine or loss of privilege, and an invitation to prosecute transgressors. A lex imperfecta might give rise to a prosecution, on general grounds of treason to the people, of those who disobeyed it, but the danger was more remote. Although individuals could be exempted from the effect of a law (privilegium) either by an assembly or the senate, a law itself, if properly enacted, could only be overthrown in whole or part by subsequent legislation. However, through the lex Caecilia Didia of 98 BC, a procedure was devised whereby the senate could declare that the people were not bound by a certain law on the ground that the procedure of its enactment was faulty. A senatus consultum was the resolution of the senate made in response to an issue put before it by a higher magistrate or tribune of the plebs. The senate took a view either about the interpretation of the circumstances put before it (e.g. that an action was contra rem publicam) or about a course of future action. The language used is respectively censeo + accusative and infinitive or censeo + uti with the subjunctive. The consultum was either specifically addressed to a magistrate or magistrates or by implication required the magistrate who consulted it to take appropriate action. It was the presiding magistrate’s task to draft (with assistance) the text and communicate it to the relevant people. Some senatus consulta were only relevant to the immediate circumstances and swiftly became obsolete. Others, e.g. the S.C. de Bacchanalibus (FIRA I, no.30) were normative over a long period. The latter might well have seemed equivalent to a lex, especially as it included a sanction against transgressors. However, a S.C. could not rescind or override a properly passed law (see above). Moreover, by its very nature of being advice expressed to a magistrate, a senatus consultum was valueless, if the relevant magistrate chose not to accept the advice, i.e. if he refused to publish it or act on it himself. What was the role of the Consuls as legislators compared with the Tribunes during the Middle and Late Republic? Did the Consuls in anyway loose their legislative influence in the end of the Republic? There is no doubt that the majority of the laws of which we have knowledge in the middle and late republic are plebiscites proposed by tribunes of the plebs, which cover a broad range of matters – constitutional, civil, and criminal law; social and economic matters; some religious matters; in the late Republic even wars and the appointment of military commanders. By contrast, legislation by consuls and praetors is much more restricted. If we look at the post-Sullan period , we find the consuls relatively active. Lutatius Catulus passes a law about violence in 78; Aurelius Cotta a law about former tribunes in 75; Calpurnius Piso in 67, Cicero and his colleague C. Antonius in 63, and Crassus in 55 all pass laws relating to electoral corruption; Pompeius Magnus passes a law about juries in 55 and at least three further laws about the courts and the constitution in 52; Caesar passes himself one and probably two agrarian laws in 59, also an important lex de repetundis; Pompeius and Crassus extend Caesar’s Gallic command in 55; the consuls of 73 passed a grain law; those of 72 a law permitting Pompeius to make citizenship grants, those of 57 a law bringing Cicero back from exile. Before Sulla consular laws seem relatively rarer, but note for example a consular law about electoral bribery in 181, the lex Servilia de repetundis of Q.Caepio in 106, and the lex Caecilia Didia of 98, the lex Licinia Mucia of 95, the lex Iulia of 90, also Fulvius Flaccus’ attempt to pass a law extending Roman citizenship in 125. K.Sandberg, Magistrates and Assemblies (Act.Inst.Rom.Fin.24, 2001) has argued that consuls before Sulla only legislated about ‘extra-pomerial matters’, i.e. foreign and military affairs, but he has to make this category very elastic and it is hard to include the lex Caecilia Didia in it. Moreover, it is part of a complex argument that denies the existence of a tribal assembly apart from the concilium plebis (for him consuls legislate in the middle and late republic in the comitia centuriata). This argument is based on what I still find an unconvincing interpretation of the verb fero, when used to describe legislation. He is right, however, to stress the comparative rareness of consular legislation in the middle republic and to explain this by the fact that the consuls’ chief function in this period is to fight Rome’s wars, usually a long way from the city. Had the Romans any real "priesthood" that acted collectively and tried to get a stronger position in the Constitution? Was that typical of the Roman Republic? The major priesthoods met individually in committee and occasionally two might meet in a joint committee, e.g. the pontifices and Vestales over the Bona Dea sacrilege in 62. There was, however, no general assembly of the priests. Nor can one imagine this occurring because the nature of public religion in ancient Rome was to be ‘embedded’ in politics. New priesthoods were created by legislation in a popular assembly. Some priests were elected by an unusual assembly of less than half the voting districts (tribus). Many of the rituals were carried out by magistrates rather than priests. If you seek a collectivity of priests, the nearest equivalent is the senate itself, which would have contained most holders of priesthoods. It was the senate that took decisions in religious crises such as the Bacchanalia in 186; the senate took the final decision over the rebuilding of Cicero’s house in 57 after a ruling by the pontifices on a technical religious matter. The senate took decisions about the adoption of new deities or rituals, such as the Magna Mater and the ludi Apollinares. Was there any juridical difference between a priest and a magistrate, and between a priest and a common citizen? Priests had no special juridical status through being priests, unlike the higher magistrates, who were protected from prosecution while holding office (this originally applied only to those with imperium but was later extended). If Julius Caesar had been immune from prosecution through being pontifex maximus, there would probably have been no civil war in 49 BC. However, the holders of certain ancient priesthoods, such as that of flamen Dialis, were restricted by certain ritual requirements, which might affect their legal capacity, e.g. the form of marriage they could use.